Tropical Storm Andrea Makes Landfall In Florida : The Two-Way As of 5:45 p.m. 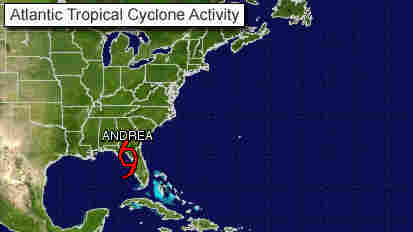 ET, the National Hurricane Center's tracking system placed Tropical Storm Andrea on Florida's Gulf coast, level with Gainesville. Andrea is expected to spread rain and strong winds along the Southeastern coast tonight and Friday. Tropical Storm Andrea has made landfall on Florida's Big Bend area, the National Hurricane Center in Miami reports. As of 5:45 p.m. ET, the center's tracking system placed the storm on the state's Gulf coast, level with Gainesville. Andrea is expected to spread rain and strong winds along the Southeastern coast tonight and Friday. The first named storm of the new hurricane season, Andrea is moving at 17 miles per hour, with maximum sustained winds of 65 mph. The Hurricane Center says the storm weakened today; it isn't expected to pick up more power in the coming days. Forecasters believe Andrea will move quickly up the Atlantic seaboard after this evening, eventually heading east over the ocean. The center has rescinded a tropical storm warning for the Florida Panhandle west of the Ochlockonee River, but it's keeping one in place for the west coast of Florida from Boca Grande to the Ohlockonee, as well as from Flagler Beach, Fla., to the Cape Charles Lighthouse in Virginia, in addition to Pamlico and Albemarle sounds, and the lower Chesapeake Bay south of New Point Comfort. "We do not expect to extend the tropical warnings any farther north along the coast," the Hurricane Center reports.